Status: Rare casual spring and fall migrant west and central, accidental in winter. Documentation: Photograph: 25-26 Nov 1984 Alliance, Box Butte Co (Thomas 1984; Mollhoff 1989). Spring: Occurrence of this species in Nebraska is closely tied to that of White-crowned Sparrow, which is primarily a migrant in the state. There are four additional reports in the period 17 Mar-14 May, none documented, but all likely correct. 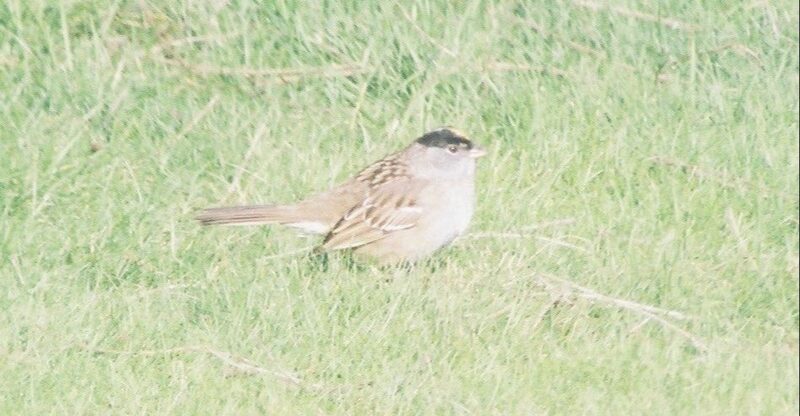 An immature was reported with White-crowned Sparrows at Sacramento-Wilcox Area, Phelps Co 17 Mar 2002. One trapped and banded at Halsey, Thomas Co 7 May 1950 was with Harris’s Sparrows (Smith 1950), but no other details were provided. Another was reported attending a feeder near Elsmere, Cherry Co for two weeks prior to 30 April 1962 (Held 1962). One reported on a spring count near Scottsbluff, Scotts Bluff Co 14 May 1966 was described as having “yellow on the crown of the head” (Banghart 1966). 18 Dec 1998 immature Harlan Co Reservoir, Harlan Co (Brogie 1999; Jorgensen 2001). The fourth report was of one in a yard in McPherson Co 7 Oct 1966; the observer had seen the species before in San Francisco (Bassett 1967). Johnsgard (1980) mentioned that one had been reported on the 1979 Scottsbluff CBC, but this apparently was an error due to a garbled data transmission (Cortelyou 1984). 1 Jan-11 May 2017 Knox Co (Silcock 2017a, 2017b). This bird was accompanied during its stay by an immature White-crowned Sparrow and four Harris’s Sparrows; both species are rare in mid-winter in the northeast. Mark Brogie delighted many observers by putting out seed at the wintering location to allow the bird to remain in the area for almost five months. Comments: Golden-crowned Sparrow is a south-easterly vagrant in fall and spring, traveling with White-crowned Sparrows and thus reflecting their distribution. There are five records for Wyoming, three from mid-Feb through May, and two for mid-Oct to early Nov (Faulkner 2010), and several on the northeastern Colorado plains May and Oct-Jan (eBird.org, accessed April 2018). In Kansas, along with White-crowned Sparrow, it is a winter resident with 20+ records Oct-May (Thompson et al 2011). There are only two records for South Dakota, in May and Oct (Tallman et al 2002), and two for Iowa, both in May (Kent and Dinsmore 1996). Photograph (top) of a Golden-crowned Sparrow at Creighton, Knox Co 2 May 2008 by Mark A. Brogie. Banghart, M.A. 1966. Golden-Crowned Sparrow. NBR 34: 76. Bassett, O. 1967. Golden-Crowned Sparrow. NBR 35: 24. Cortelyou, R.G. 1984. Golden-crowned Sparrow in Box Butte County (appended note). NBR 52: 77. Held, L. 1962. Golden-Crowned Sparrow at Elsmere. NBR 30: 50. Smith, C.E. 1950. The Golden-crowned Sparrow in Nebraska. NBR 18: 68. Silcock, W.R. 2017a. Winter Field Report, Dec. 2016- Feb. 2017. NBR 85: 2-31. Silcock, W.R. 2017b. Spring Field report, March-May 2017. NBR 85: 54-83. Thomas, D.G. 1984. Golden-crowned Sparrow in Box Butte County. NBR 52: 77.